Traces the parallel stories of nineteenth-century art patron Charles Ephrussi and his unique collection of 264 miniature netsuke Japanese ivory carvings, documenting Ephrussi's relationship with Marcel Proust and the impact of the Holocaust on his cosmopolitan family. On the whole I found Waal’s book a disappointment. I just could not get worked up about a super rich family losing their possessions and this was Waal’s fault because he has made this biography so personal. Any empathy I had for these bankers and their entourage dissipated the further I got into the book and I began to find Waal himself just a little annoying. I was not put in the best frame of mind by the self-promotion of his preface. The basic premise behind the book is a good one. Edmund De Waal has inherited a cabinet (vitrine) full of netsuke, which are small hand carved items from Japan made from wood, ivory or other materials. They are of some value and de Waal uses this inheritance to explore his family ancestry from the time that these 264 netsuke came into their possession. The Ephrussi family were Jews originally from Odessa and they settled in Vienna where they made a fortune in Banking. They were also active in Paris and this is where the book starts with Charles Ephrussi who was an art love, flaneur, and perhaps a little dilettante. The family business was centred in Vienna where the palace Ephrussi was built to celebrate their wealth and prosperity. De Waal decamps to the Capital of the Austro-Hungarian empire at the turn of the 19th century, following the netsuke which were wedding gift from Charles to his cousin Viktor. The netsuke were now part of an enormous collection of artifacts and we follow the fortunes of their owners as they struggled to maintain their position in society during the fierce anti-semitism evident during the first half of the 20th century in central Europe. Hitler’s Anschluss of Austria Hungary saw the persecuted family lose most of their wealth and possessions as they flee the Nazis, many of them going to America. The final section of the book sees the netsuke in Uncle Iggy’s possession as he settles in post-war Japan doing what the family does best: making money. The book settles down to be a life and times of the family Ephrussi, there is no mystery about the netsuke which are only of interest when they are owned by the family. The family did live in turbulent times and so there is a story to tell and de Waal tries to imagine what it must have been like to be part of this rich family. He therefore invites us to walk with Charles through his large Parisian house with his latest acquisitions on show, bought as a result of his friendship with the impressionist painters. There were issues however and de Waal tells us that Renoir became suspicious of this Jewish connoisseur: was it the love of art that guided him or was it mere acquisitiveness with an eye for an investment. De Waal says “And it was at this point that Charles Jewishness made him suspect.”. It is also the point in the book where being Jewish and suffering from the anti-semitism that abounded at the time becomes the guiding theme of the book as it must, for a story about a Jewish family living in Paris and Vienna at that time. De Waal treads a fine line between a biography of his family and an historical fiction of their life and times. There are no references or notes (yet there are plenty of quotes from contemporary documents}, which tends to push the book more towards an historical fiction. This is not to say that de Waal does not do this well, some of the best passages of the book describe Paris at the fin de siècle and Vienna at the time of the Nazi invasion. This jewel, this highly personal chronicle of art and history, is quite simply the best book I've read in a long time. Even setting out to write a small review, I know I won't come near to doing it justice. I had to stop several times while reading to reach for the laptop (bless the internet!) to get a glimpse of a Renoir or Manet that was intrinsic to the story; to scan the family tree at the front of the book to make sure of relationships and dates; often, to wipe my tears away. My dilemma was wanting very much to know what happened to this family yet not wanting the book to end. It begins when celebrated English potter, Edmund de Waal, inherits over 200 netsuke from his great-uncle Iggy. Netsuke are carved items used as toggles to fasten a purse worn on the Japanese obi or sash. They are made of ivory or wood and depict scenes from everyday life or nature. Each is an intricate work of art and the story of how they came into Iggy's possession fascinated the young de Waal. While he knows something of his father's family, the Ephrussis, he uses their ownership of the netsuke to trace the history of the family of Jewish financiers who made their vast fortune in grain in Odessa and moved on to live lavishly in Paris and Vienna in the late 19th century. In Paris, Charles Ephrussi purchases the netsuke as well as paintings and sculpture of the great artists of the day. Proust is his assistant for a time and uses him as a partial inspiration for Swann of "Remembrance of Things Past"; Renoir includes him in a famous painting. In Vienna, the netsuke's next home, the massive Palais Ephrussi dominates the Ringstrasse and is so lavishly furnished, it's the first private home targeted by the Nazis after the Anschluss. All this art and history is fascinating but what sets the book apart is de Waal's writing. This is a personal odyssey for him and the reader feels this on every step of the journey. He is trying to uncover truths and understand the prejudices of the time. Anti-semitism lurks everywhere, underneath, even as the Ephrussi try diligently to assimilate in every way. When it bursts forth like a massive head of steam, the results are terrifying. De Waal is an artist, a sensitive man, and he allows the reader to sense his emotions at every revelation. He steps into his great great grandmother's dressing room and reminds us that here is where the netsuke were kept so the children could play with them while she dressed, and here is the view outside, and here are what the trees looked and smelled like. You are there. He has introduced you to everyone and you know them all. And when things go wrong, you're there too. After struggling with this for nearly a week, I had only reached 100 pages. I really wanted to enjoy it, I'm a great fan of biographies, but there was just too much information packed in, fact after fact, dry, dusty. The netsuke sound wonderful, I'd like to see some in the flesh. I Googled them and loved all the varied little characters. I'm told the last 100 pages are excellent and maybe one day I'll go back and have a second attempt, I read a lot of holocaust records and I believe the ending brings us to that era. But there are many excellent books from that time, will I really choose to have another go at this rather than another account? Edmund de Waal has written a lovely book centred around the history of a collection of Japanese netsuke he inherited from his great uncle. By using the netsuke de Waal has created a book which is both personal, as he explores the daily lives of his various ancestors who owned the netsuke, but also universal as politics and economics impact their daily lives. As is inevitable with a story about a wealthy Jewish family living in Vienna, the sections centred around WWII were both horrible and fascinating and de Waal’s anger and frustration at his ancestor’s treatment at the hands of the Nazi’s is compellingly conveyed. A beautifully realised book; almost crafted rather written - like a series of netsuke rather than chapters. An intriguing starting point for what is in effect a diasapora history of the last 150 years. Having inherited 264 netsuke, Japanese wooden and ivory carvings, Edmund de Waal, a ceramicist, decides to try and trace the origins of these little ornaments. His search and research take him to how netsuke are created and then segues into the history the man who bought and built this collection, Charles Ephrussi, the youngest son of the House of Ephrussi from Odessa, the Kings of Grain, the family he belonged to and ends with the author's connection to the family. His research becomes more than just tracing the journey made by these netsuke and the vitrine they were placed in. It takes him to the history of the family Ephrussi, from the time they became powerful grain merchants in Odessa, to a powerful dynasty spreading into France and Vienna through the 19th and early 20th Centuries, to the tragedies during the Nazi occupation and the resettlement of various family members across America, Japan and the UK after WWII. At some point, the netsuke take a back seat to the unfolding family history, but they do remain in the background, never forgotten, and at times they leap back into the spotlight, and the story behind their survival against Nazi looting is short of miraculous. The author, Edmund de Waal, becomes the 5th generation in his family to inherit a large collection of Japanese netsuke, small wood and ivory figurines. The collection, obtained by the family in the late 1800's, have an interesting past, including traveling from Japan, to Paris and to Vienna. The book traces not only the path of the art objects, but also follows the family's history, from being one of the most influential and wealthy families in Europe to their downfall when the Germans invade Austria during WWII. Although the writing in the book was easy to read and very descriptive. I felt that de Waal spent too much time covering his research process and what he did in the present to dig up his family's past. This was my bookclub's selection for October and although not everyone loved the book, it did spark some interesting conversation about anti-Semitism throughout the ages. A wonderful book by a talented writer. Part family memoir, part holocaust narrative, de Waal's meditations on the nature of our relationships with objects is fascinating -- what they displace in the world, what we choose to hold, to touch, how their loss affects us, and how they stand as metaphors for how we live. The narrative is framed by de Waal's quest to understand how a collection of netsuke's (the small, intricately carved Japanese objects used to weight the end of obis -- kimono belts), which he now owns, came into the family possession. De Waal, who is an acclaimed potter, comes from an intriguing family. The once-fabulously wealthy began as grain merchants in Odessa and rose to international prominence as bankers at the center of the art world of Belle Epoque Paris (hobnobbing with Proust, Degas, Renoir and other such luminaries) and Vienna just prior to World War II. The author writes about their lives with imagination and elegance. His description of the moments when Vienna fell and the Palais Ephrussi, the family home (albeit an unusually grand one), was overrun by Gestapo is both heartbreaking and horrifying. The last section of the book, dealing with the author's uncle in Japan is less evocative, and perhaps this is merely because it can't help but pale in comparison to the previous sections. Then, too, de Waal has a moment of odd crankiness when he snaps at a friend who questions his determination to keep the museum-worthy collection rather than return it to Japan. He states he has every right to keep the netsukes. "No, I answer. Objects have always been carried, sold, bartered, stolen, retrieved and lost. People have always given gifts. It is how you tell their stories that matters." Is this true? I don't think so, not entirely. The first part is undeniable, but the second -- that it is only the stories that matter -- I cannot agree with. I think of the sacred objects that have been stolen from First Nations people, for example, and I believe they should be returned. The fact people have always stolen, bartered or given them away is not moral justification. I do, as a writer, understand the power of stories, but cannot use this power to negate my responsibilities, not even if Renoir painted my ancestors, not even if Proust wrote about them. I found this to be a well-written and thorough personal journey. I happen to really enjoy this genre, especially when there is a family tree at the beginning, to follow the story from generation to generation. Still, I did find it a bit slow at the beginning and actually put it down for a few months upon hitting the half-way point. It was good, engaging and I did not want to abandon it. I picked it up again a few days ago and found the latter half of the book much easier and more interesting and was able to finish without any problems. A very unique and personal history of a Jewish family from the late 19c to 20c. Very well written and engaging. Excellent read - biography and study of Paris, Vienna and Tokyo at different times, beautifully written, and covering some large themes. Recommended. A biography of a collection - it's a good idea and a great read. First we follow a foppish flanuer, then watch as his moneyed family's empire crumbles to dust, and so forth...all endured stoically by the eponymous hare and his friends. This book is written by an artist, a very fine artist of ceramics, and the beauty of his writing is extraordinary. He takes you to Paris, Japan and Vienna, tracing his ancestors and the netsuke's history. Non-fiction at its very best. I read the first 33 pages of this book and started to lose the will to live. 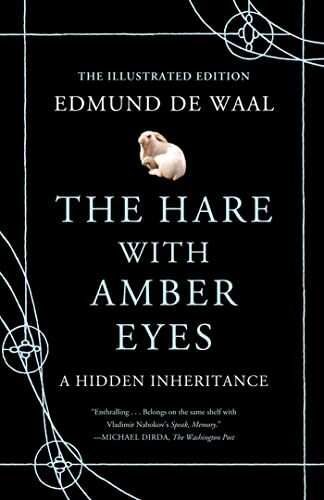 The protagonist is using a family heirloom, a "netsuke" carving of a hare with amber eyes, as a thread to trace his family's history. While the backcover blurb promised the unveiling of "a story far larger and more dramatic than" the protagonist could ever have imagined, the descriptions of Paris streets and explanations of family empire building, did not enthrall me to the extent that I was willing to waste more of my life wading through dross while waiting for the big picture. I did not see sufficient promise of a rewarding read in the first 33 pages.